2011 March - Lucretia Regina-Potter Republican District Leader 46AD - Finally a Voice for the 46th Assembly District! It’s not easy for a woman to get an abortion in South Dakota. There is only one abortion clinic in the state. As of Tuesday, it got even more difficult. Republican Gov. 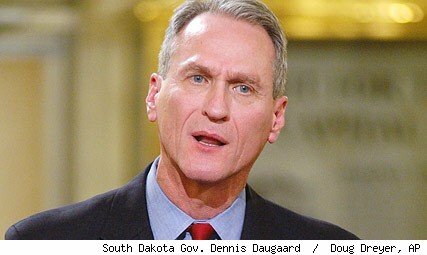 Dennis Daugaard signed a bill requiring women seeking an abortion to wait three days after meeting with a doctor and receive counseling before undergoing the procedure, news agencies reported. The measure brought condemnation from abortion rights groups. CBS News.com said that the American Civil Liberties Union, ACLU of South Dakota and Planned Parenthood Federation of America announced Tuesday they plan to file a legal challenge to the law, which is to take effect July 1. The governor said state attorneys have agreed to defend the law and that he’s spoken with a sponsor who has pledged to finance the state’s legal costs, the Associated Press reports. South Dakota is hardly alone in staking out new territory in the abortion battle. Many statehouses where Republicans have a majority are contemplating new abortion restrictions. “State bills are currently pending all over the country, and many states are considering multiple abortion-related bills,” according to CBS News, which published an in-depth story on the issue. In South Dakota, the three-day waiting period would be the longest in the nation, according to Planned Parenthood of Minnesota, North Dakota, South Dakota. Planned Parenthood operates the only health center in South Dakota that provides abortion care. “The voters of South Dakota, by resounding margins at the ballot box, twice have told their legislators that the decision to have an abortion is between a woman, her family and her doctor and that government should not intrude on that decision,” said Sarah Stoesz, president and CEO of Planned Parenthood Minnesota, North Dakota, South Dakota. The counseling provision of the bill has attracted a good deal of the criticism. According to Planned Parenthood, the law has no requirements surrounding the qualifications of the crisis centers’ counselors. “Furthermore, the crisis pregnancy centers must have as their central mission a desire to dissuade a woman from having an abortion, no matter what her particular risks or circumstances,” the group says. Abortion opponents, however, say the bill gives women thinking about an abortion “both sides of the story,” as the measure’s main sponsor puts it, according to The Christian Science Monitor. St. Joseph’s Day is a Roman Catholic feast day commemorating the life of St. Joseph, the step-father of Jesus and husband of the Blessed Virgin Mary. People with very strong religious association, often those of southern Italian descent, typically celebrate St. Joseph’s Day. March 19 is said to be St. Joseph’s birthday. During a famine in Sicily, when food was scarce and many people were starving, the poor people had only their faith to rely on. St. Joseph was known as the protector of the Holy Family and Italians had strong family relationships, so they prayed for St. Joseph to intercede for them so they could have successful crops. Their prayers were answered, and the famine came to an end. In gratitude, people promised to make annual offerings of their most precious possession – food – in St. Joseph’s honor. Today, the faithful erect “St. Joseph Tables,” which are set to honor St. Joseph. They are filled with beautiful and often elaborate foods, including meatless dishes such as stuffed artichokes, pasta and fish, as well as breads, cookies, pastries, cakes and other delicacies. Each table is blessed by a priest and presided over by a statue of St. Joseph. A stalk of lily blossoms, votive candles and a lace tablecloth are other typical items used to decorate the feast table. When you visit a St. Joseph’s table, you often receive gifts of fava beans and breads. Fava beans play an integral part of the celebration because this was the food that saved the Sicilians from starvation. The bean is said to bring good luck, and it is believed that if the St. Joseph’s bread is kept in the home, the family will never starve. What Part of “Unconstitutional” Is Confusing? Roger Vinson, the U.S. federal judge who ruled Obamacare unconstitutional in its entirety, has ruled again on the health-care law. On Thursday, Judge Vinson issued a stay on his earlier ruling that the law could not be enforced. In doing so, he sent a clear message to the Obama administration: Appeal my decision to a higher court or stop implementing the law. When Judge Vinson ruled on Jan. 31 that the health-care law was unconstitutional, the administration followed up by filing a motion for clarification rather than filing an official appeal. Vinson’s ruling criticized the administration for that action. Now, Vinson has given the Obama administration an ultimatum to either stop implementing the law, or appeal it - presumably to the Supreme Court. It is unclear what will happen if the administration ignores that order. Following Vinson’s initial ruling, Florida and Alaska stopped implementing the law. Several other states have lawsuits pending challenging its constitutionality.